ACT Fibernet today announced the launch of its 1 Gbps high-speed broadband plan in Chennai city. The new plan is priced at Rs 2,999, which is by far the affordable price when compared to other cities Hyderabad and Bengaluru where the Internet Service Provider is also offering 1 Gbps plan at Rs 5,999. The ACT Giga plan with 1 Gbps download and upload speeds comes with a monthly FUP of 3TB or 3000GB, post which the speeds will be reduced to 2 Mbps. Alongside the new plan, ACT Fibernet also announced offers for customers who choose the plan for six months or one year. On six months Giga plan subscription, customers can avail one-month free subscription. Similarly, for 12 months plan, customers can enjoy two months subscription free of cost. That said, the company also confirmed that irrespective of how many a customer chooses the plans, they will be charged Rs 2,000 as installation charges. On top of the new announcement, ACT Fibernet also upgraded its entire broadband plan portfolio for Retail, SOHO and SME which will now offer more data at the same prices. Under the Retail plans, the ACT Basic plan has been upgraded to 120GB FUP limit with 30 Mbps speed, followed by the ACT Blaze plan which now offers 500GB FUP limit with 100 Mbps speed. Moving on, the ACT Blast Promo broadband plan has been upgraded to 1000GB FUP limit with 100 Mbps speed; the ACT Storm has been upgraded to 1250GB FUP limit with 125 Mbps speed. Likewise, the ACT Lightning plan has been upgraded to 1500GB FUP limit with 150 Mbps speed; the ACT Thunder broadband plan has been upgraded to 1750GB FUP limit with 200 Mbps speed, and lastly, the ACT Incredible has been upgraded to 2000GB FUP limit with 250 Mbps speed. As we reported recently, the Retail broadband plans come with additional offers if a customer chooses them for six months or a year. Customers opting for ACT Basic plan for a period of 6 months can avail one-month free subscription or a free Wi-Fi router, and for 12 months plan get two months free subscription or one-month free subscription with free Wi-Fi router. Similarly, for ACT Blast Promo 6 months plan, the company offers two-month free subscription and a free Wi-Fi router and 12 months plan includes six months free subscription with a free Wi-Fi router. On selecting either ACT Blaze, ACT Storm, ACT Lightning, ACT Thunder and ACT Incredible plan for 6 months, customers can choose two-month free subscription or one month free subscription with a free Wi-Fi router, while on 12 months plan customers can enjoy three months of free subscription or two months free subscription with a free Wi-Fi router. ACT Fibernent first launched the ACT Giga plan in March 2017 in Hyderabad city at a price of Rs 5,999, which along with taxes goes past Rs 7,000. Later on, the company extended the same to Bengaluru city and now, Chennai joins the list of cities where ACT is providing 1 Gbps broadband connection. Notably, the plan has been introduced at just Rs 2,999, while in the other two cities, it’s priced at Rs 5,999 per month. 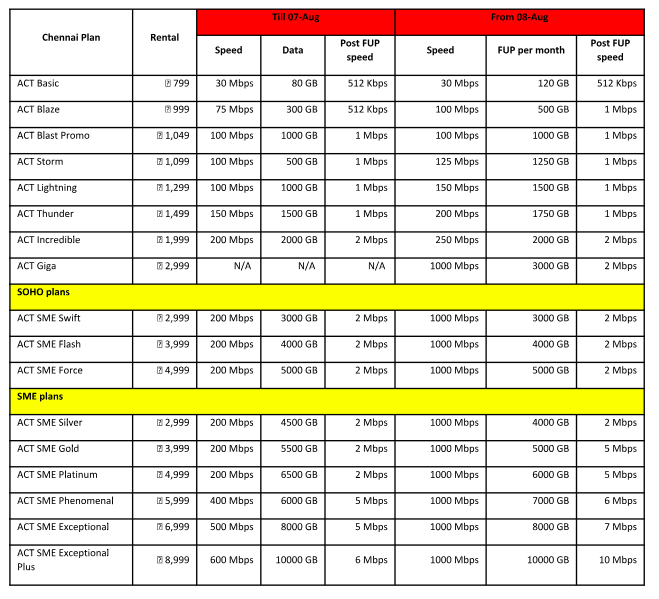 As per a recent report by Ookla, Chennai tops in fixed internet broadband speeds. 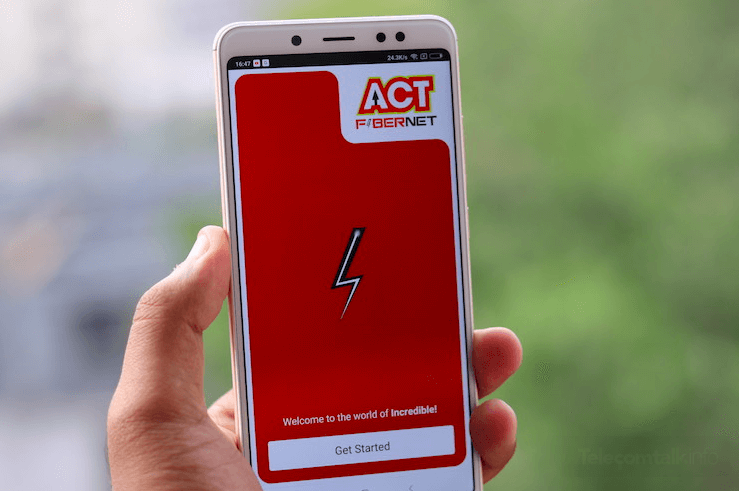 With the launch of 1 Gbps broadband plan, ACT Fibernet aims to meet the incessant need for high-speed broadband connectivity and further enhance customers internet experience. Useless. Post FUP speed is still less than BSNL. Useless regional provider.